In April 2015, a fire destroyed the Berth No. 1 timber pile dock structure at Squamish Terminals, in Squamish, BC. 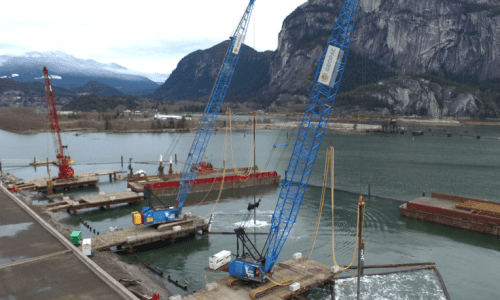 Geopac partnered with Fraser River Pile & Dredge (FRPD) to deliver a complete foundation package for the reconstruction of Berth No. 1, which included ground improvement prior to re-construction of the new steel pile and concrete deck berth. 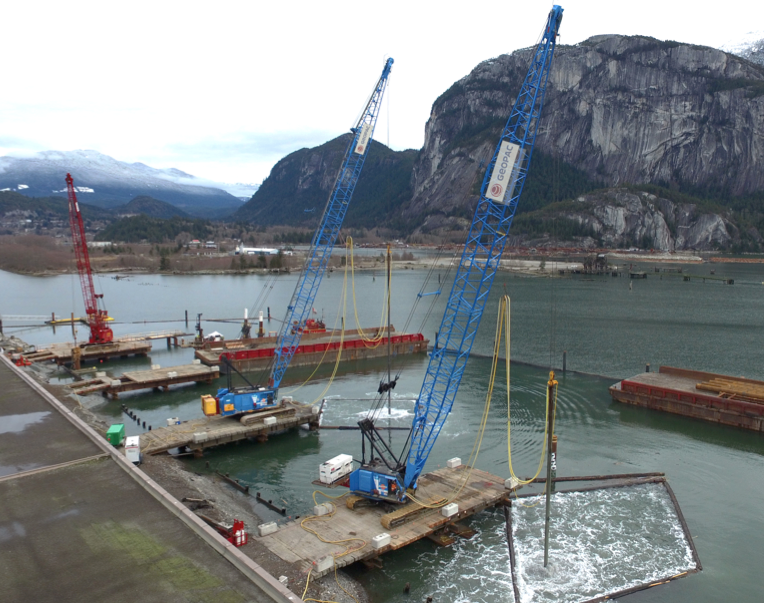 The Squamish Terminals site is situated on the outwash delta of the Squamish River which empties into the north end of Howe Sound inlet. The ground improvement area extended offshore from the terminal land platform and involved densification of the marine slope to a consistent depth of 23m below sea-bottom elevations. The offshore soil conditions consisted of mainly clean sand with some silt and the occasional gravelly sand layer occurring every 2m to 8m to termination depth. It was determined that the existing granular soil conditions were susceptible to liquefaction during the 1 in 2,475 year design earthquake. Densification of the native sloping seabed and immediate terminal foreshore fills was required to a depth of 23m to mitigate liquefaction, protect the foreshore slope against failure / lateral displacements during seismic events, as well as provide lateral support for the steel pipe piles. A ±2m thick stone blanket was first placed on the seabed to provide a source of feed material for the Vibro Replacement densification work. The Vibro Replacement methodologies and sequence of work was specifically designed to satisfy the Engineer’s performance requirements and to limit induced settlement / displacement of the existing terminal platform and adjacent storage building during the work. The compaction point grid was specifically configured to provide ‘pile windows’ to accommodate subsequent pile installation. The offshore densification work was carried out from temporary, pile supported trestles that extended from the foreshore into the marine slope. This approach was determined to be more economical and efficient with significant schedule advantages over operating from a floating derrick. The densification work was completed utilizing two suitably sized Vibro rigs capable of reaching the full treatment limits from the four trestle platforms. Post treatment CPT testing from a customized floating work platform confirmed the Vibro Densification program met the design relative density requirements.